"Many unique crochet hooks to choose from"
With so many different types of crochet hooks it is sometimes difficult for a beginner to know where to start! 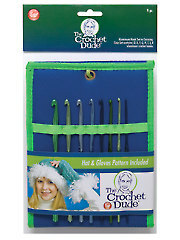 There is a crochet hook suitable for every preference and every project. The hooks are made from different materials and come in many sizes and shapes. Handmade crochet hooks were carved out of wood at home for use in making blankets, doilies, drapes and other needs. Wooden crochet hooks have come a long way since then! 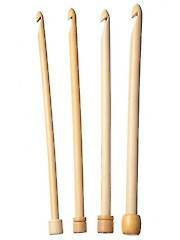 When picking out a wooden crochet hook, be sure it is smooth with no rough spots and has a nice, smooth finish. Usually wooden crochet hooks are straight and round with the hook carved out. The width of the hook will determine the size of the stitch. The size of wooden crochet hooks is usually shown along the opposite end than the hook side, on the side. Wooden crochet hooks are good for use with slippery yarn because there is a little more friction when you use them and there is more control. They are also good to hands that tend to get painful after crocheting a while. The wood is a softer touch on your fingers and bones. 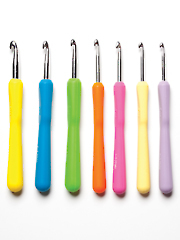 Plastic crochet hooks can be a joy to use when considering the types of crochet hooks. They are lightweight and glide through the yarn nicely. They also come in a variety of colors with some being clear so you can see through them and some opaque. The sizes are in no way color-coded, so you must look to see what size the plastic crochet hooks are. The size is usually shown on the opposite end than the hook end, along the side of the hook at the bottom. If you tend to do very tight work, plastic may not be for you because they can break. 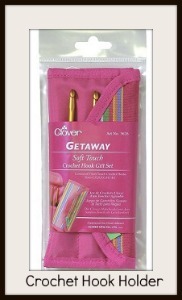 You need to have a smooth, light touch to use plastic crochet hooks. 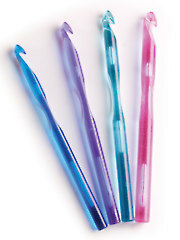 Plastic crochet hooks are compatible with just about every kind of yarn. They are also very economical. 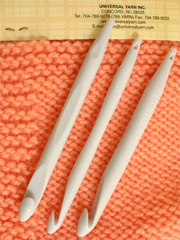 Alumiun or steel crochet hooks are probably the most popular of the different types of crochet hooks. The small steel hooks are used to crochet fine work, such as doilies from thread. The larger hooks are used for yarn, for blankets, clothing, toys and a variety of projects. Metal crochet hooks are very strong and durable. Perfect for those who hold the hook tightly. Be sure, if not buying a known brand name, that the hook is smooth with no rough spots. Metal crochet hooks usually have a thumb rest in the middle. The size of the hook is usually shown on the thumb rest. The circumference of the shaft of the hook will determine the size of the stitch or loop that will result. They also come in bamboo, a plant of the grass type. Bamboo hooks are often expensive, but they have a nice feel in your hand. You may find one that has a personality that is just for you. There are many things to consider when picking out a crochet hook from the different types of crochet hooks. If you are using a crochet pattern, you will need to use the size of crochet hook that will result in the gauge that is shown in the pattern. If you don’t have the right gauge, the item may turn out a different size than intended. You also should consider the type of yarn or thread you will be using. You can make wraps to keep the chill off your neck in the spring and summer air conditioning as well as cozy warm items for winter, so crocheting is an all year round hobby. 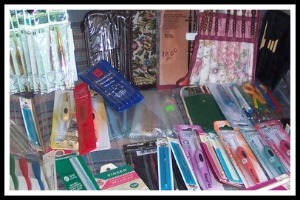 You will find many different types and style hooks at Annies, a great place for all your craft supplies.